Help Documents - Version 5 Group Registration SetupHow do I use the Group Leader Dashboard? 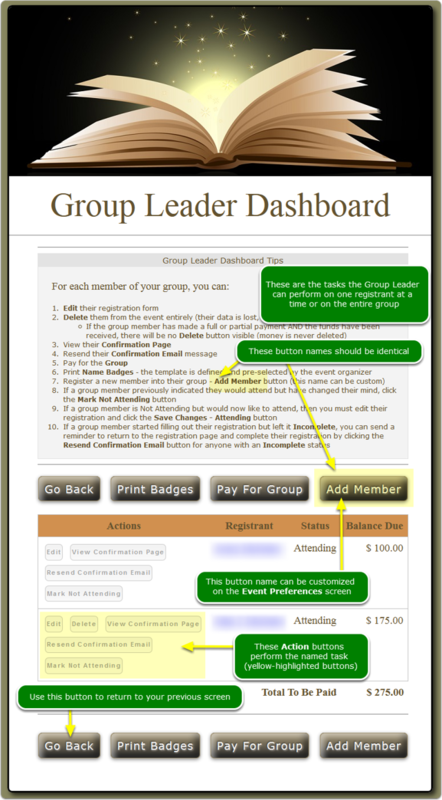 The Group Leader Dashboard is used by the Group Leader to manage his/her member registrants. The event organizer must turn on this feature if they need it. It is NOT a default tool. How does the Group Leader access the Group Leader Dashboard? The only way to get to the Group Leader Dashboard is clicking from the Group Leader's Nav Panel. 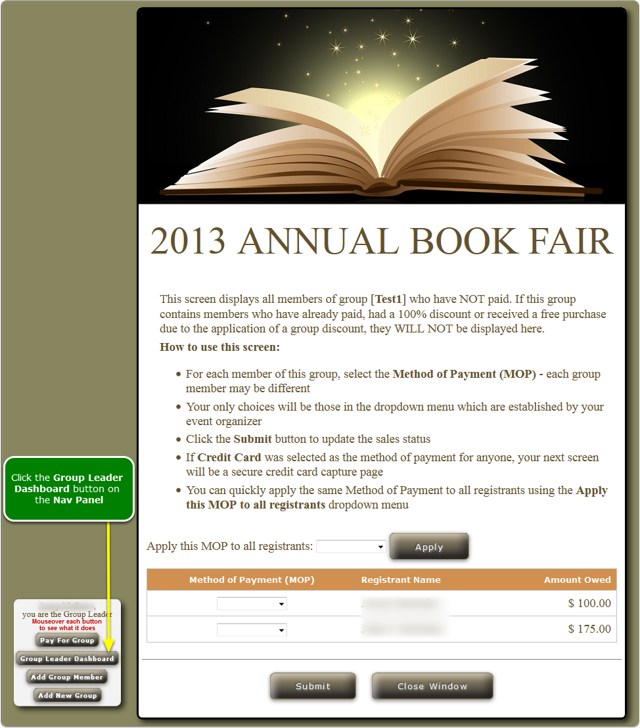 The example below is the Group Leader Payment Page. Zoom: How does the Group Leader access the Group Leader Dashboard? The large buttons are tasks that apply to all members of the group. In the listing of group members, the Actions column contains the tasks that apply to ONLY that member. Why does one registrant have a Delete button while the other does not? The first registrant does not have a Delete button because they are the Group Leader. BEST PRACTICE: Change as little as possible; just what you need for your event's jargon. Prev: How do I turn on the Group Leader Nav Panel and Group Leader Dashboard? Next: Where do I access the Table Wizard?